Create your Own Lacrosse Plays Today! 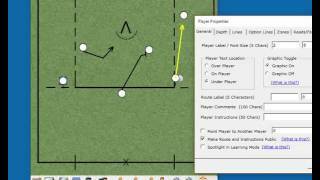 The complete play editor for both coaches and recreational players. No monthy subscription. You own the license. Free upgrades for one year. All three sports are included in each license. Each license allows activation on up to five computers. No monthly subscription fees & free upgrades! 14,000 coaches in 41 countries use Play Designer! Coaching a team of 6 to 9 year olds, I knew I needed something that could help my players visualize what they're supposed to do for each play. I used to do things the "hard way" in practice - using a whiteboard and dry erase marker to map out each play and show each player what it is they had to do. While it worked, it was messy, time consuming, and not very practical to use during a game. Since I started using your football play designer, I've seen a huge difference in how quickly my players learn their roles on the team. What used to take an hour or more per week can now be done in 10 minutes - I can sit my players around my laptop in practice and animate each play so they can see how plays develop. I'd just like to thank you guys for making an easy-to-use, affordable play editor that allows me to design plays for our 9-on-9 atom football squad. I am the Offensive Coordinator for the Western Pennsylvania Warhawks which is a new team in the Grass Roots Division of the NAFL. This is a semi pro league that prides itself on getting players ready to move on to a higher level whether it be the CFL, NFL, or AFL. I have loved the game of football all my life and at 23 I have found myself in the position of Offensive Coordinator for this team. I can not say enough about how much time your product saves me in drawing up new plays and also typing up summaries to go a long with the play. The ability to also view the play in action also allows me to have an idea of timing can be worked out on the field of play. I have been an assistant coach for several years and feel our teams have always suffered from not having clear, concise playbooks. When you can only practice three hours per week you had better have a way for your players to learn the plays before they get to practice. Football Play Designer from Wheelbarrow Software has given me an economical and quick way to do this. I have demo'd three other playbook software programs and found them little more helpful than just using the "paint" program on my operating system. Thanks for a great, easy to use system. I just want to say how much I appreciate your reasonably priced Play Designing Software. I coach the 4th grade team at OLMC and I do not have the resources to spend $100’s or $1000’s to illustrate my plays but need to be able to create and illustrate plays for my kids. Your program allows me to do just that and it is so easy to use.